William Hayes and Jevon Kearse wore each others' jerseys in practice one day. Photo by Andrew Strickert for Total Titans. Continuing our offseason positional analyses, we now take a look at the defensive ends. The Titans started the 2009 season with five DEs and finished with six on the roster. Three of the six are free agents who will more than likely not be back in two-tone blue this season and another is an untested commodity. That leaves only two who are certain to be on the roster in September so this position group should have more turnover than any other for the Titans this offseason. We continue our offseason positional analyses, in which we take a look at the state of affairs within each position group. What’s the contract status of the players at that position? Are any of them potential losses? Is there a need to upgrade the position, either in March through free agency or in April via the draft? In earlier articles, Drexel examined the quarterback and receiver positions and I took a look at the guards. Today we continue on the offensive line with a look at the tackles. After concentrating on the state of affairs at the quarterback position, naturally, we’ll now focus our attention on the players who catch their passes. 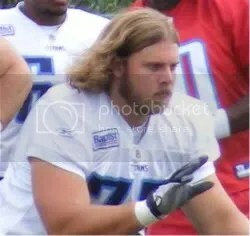 Over the course of the next several weeks, the staff at Total Titans will take a look at how the Tennessee Titans stack up at each position as we continue upon the seemingly endless trail of the NFL offseason. How did a team that was 13-3 a year ago get so bad, so fast? 20 of 22 starters from that team returned this year. So did a lot of other players who got significant playing time. Setting aside for the moment the question of coaching, let’s take a look at those players, position by position, and compare their performance this year with last year. I’ve used the following scale of one to five stars in rating both groups and players. We continue our positional analysis series with a look at the Titans’ safeties. And, in what seems to be a recurring theme for the series, the Titans return both their starters at safety, and those returning starters are pretty good. Chris Hope returns for his fourth year as the anticipated starter at strong safety. Except for missing the last five games of the 2007 season after sustaining a neck injury, he’s provided a very solid presence. His partner at the free safety position is Michael Griffin, who’ll be entering his second year as the incumbent starter after leading the Titans with 7 interceptions in his first season as a starter. As the Titans continue with training camp and the preseason, we continue looking at the team position by position. Today we review a position group with several dynamics in play, outside linebacker. 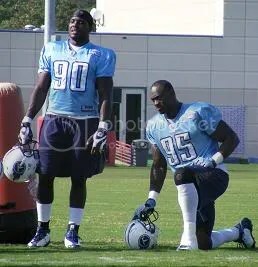 The Titans have arguably the best pair of OLBs in the division, in Keith Bulluck and David Thornton. Bulluck has led the team in tackles six of the last seven years, with Thornton achieving that for one year as well. Since becoming full-time starters, Bulluck has averaged 126 tackles per year and Thornton 104. That works out to a combined average of over 14 tackles per game, meaning they’ve been very active defenders. They’ll start together for the fourth year in a row and very possibly the last year. 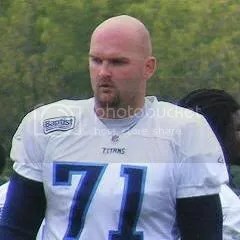 This is the final year on the 32-year old Bulluck’s contract and he’s said he doesn’t expect to be a Titan following this season. Bulluck has the highest cap number on the roster and while it’s manageable this year, he’ll be wanting a nice raise by February. It’s hard for me to imagine Mike Reinfeldt offering Bulluck the kind of big payday he’ll be looking for in what will probably be his final contract as a player. You are currently browsing the archives for the Positional analysis category.